I grilled up a batch of country style ribs and thought they were pretty enough to warrant a post. The pork got a solid coating of Gordon’s Grub Rub and sat on the counter while I fiddled around and got my Weber kettle fired up. 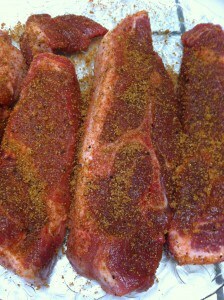 The Grub Rub is a pretty sweet dry rub that has a natural tenderizer as a component. 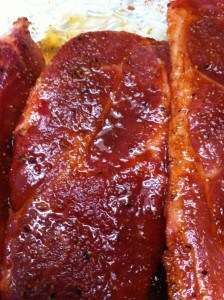 If you want to benefit from the tenderizing enzyme you would need to let the meat rest overnight with the rub. I was in a hurry and skipped this part. I also did not apply a mustard slather to the country style ribs like usual. 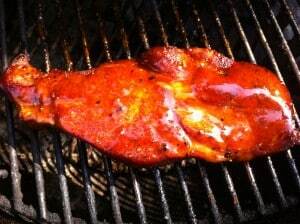 I set up the Weber Platinum for indirect high heat using Kingsford charcoal and a chunk of hickory. 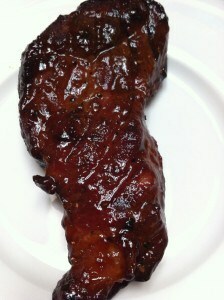 By the time the grill was ready (~300F dome temp) the Grub Rub had melted into the country style ribs and looked great! After I cooked these guys for about an hour they had an internal temp of ~155F. I decided to cook them a little longer as I wanted to try to get them a little more tender. 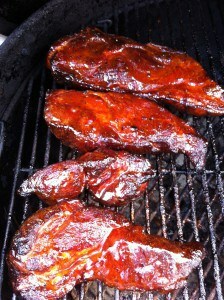 I applied a glaze of Sweet Baby Rays and agave nectar and let them go for almost another hour on the pit. I moved the country style ribs as far away as possible from the fire to make sure the glaze didn’t burn. As soon as the ribs looked like this I couldn’t stand it anymore and had to eat them. 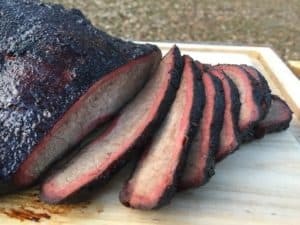 They tasted great, looked beautiful and had a pretty little smoke ring. These country style ribs were a little on the dry side so I probably should have pulled them a bit earlier. That’s okay; it gives me an excuse to practice a little more! Thanks for looking! If you enjoyed this post please share it through one of the buttons below (Facebook, Twitter, etc.). 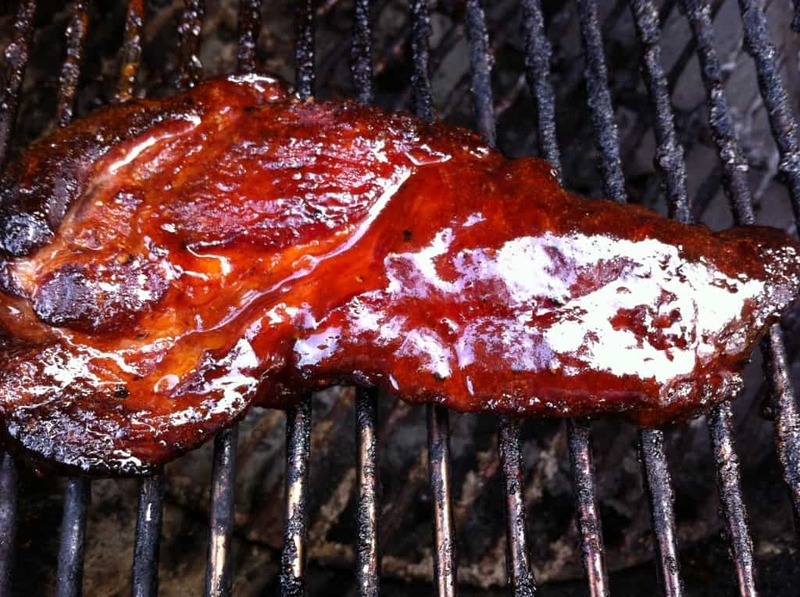 Update 12/14/12 : I have had so much fun learning to cook country style ribs I have created a new website exclusive to the topic. 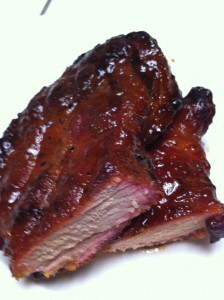 Check it out at Country Style Ribs.